ASN Natural Stone, Inc. began in 1992 as a stone tile, slab fabrication and installation brokerage service for San Francisco and Bay Area architects, contractors, designers and their clients. Originally named Alex Stone Network, the business started in a Haight Ashbury flat, drawing on Alex's 6+ years of experience in companies involved with stone importing, distributing, fabricating and installing. Several years later when business was really picking up Alex's girlfriend Rose offered to help out for a few months and that was the real beginning of the ASN of today. Rose brought her extensive project management skills which allowed the company to take on and complete larger and more complex projects, including a new Sonoma residence designed by Olle Lundberg that saw ASN import its first large quantity of 16 x 16 Portuguese stone for interior tiles and exterior pavers. It was coincidentally named Rosal and was sourced from the quarry shown on this page. ASN pioneered large format tiles and pavers, textured surfaces and concentrated on sourcing unique stones to offer clients something different. ASN also has the distinction of being the first importer to regularly import and stock the 24 x 12 stone tile size - since the fall of 2001 - which has now become standard for upper end importers in the U.S. ASN Natural Stone is still a family run company and together with a highly capable sales staff has decades of experience working with natural stone, design and project management. Never content to rest on its laurels ASN is always looking for new materials with interesting possibilities that will help clients' projects be that much more special. Alex Sajkovic’s passion for natural stone grew out of a serendipitous meeting with the sales manager of an Italian-American stone company that was driving the same model FIAT 131 as Alex. 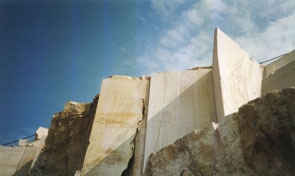 Always having been intrigued and stimulated by Italian design it seemed natural to accept a job in stone sales and service that involved driving that FIAT across the Golden Gate Bridge every day - showing beautiful white Carrara marbles and other stones to clients in Marin, Sonoma and Napa counties. Fast forwarding through 3 stone companies and a few recessions Alex is now working on business development and marketing, including the architectural sampling and outreach program at ASN. In addition to the daily business of ASN Alex wants to raise the profile of stone as a green building material: “Stone is not a scarce resource...we live on a blue and green spinning rock! Natural stone is not manufactured and is minimally processed - having a relatively low carbon footprint. If you consider the rock cycle where stone is simultaneously eroding and being formed - and that it is such an abundant natural resource that is virtually impossible to deplete - then it follows that natural stone is a sustainable material". Rose M Garcia used to write hazardous waste management plans for California counties including Fresno and San Francisco before she brought her knack for organization and administration to ASN. Customer service, client satisfaction and helping the sales staff maintain smooth running projects from start to finish keeps Rose humming. Her tireless dedication to details and seeing everything through has cemented ASN's reputation for customer service as many repeat clients will attest. Her first project at ASN was to find 'stone that looks like wood' for a project in Tokyo, Japan. She's overseen airfreighting stone slabs to Hong Kong from seven countries for a mock-up and provided the Dallas Galleria shopping mall with a new limestone floor from Cairo, Egypt. She consistently runs a tight ship and takes care of the ASN family. Wendy Ashton had an early appreciation for building and design,and pursued her degree in Architecture at the University of California, Berkeley. After graduation she had an immediate introduction to the natural stone industry in San Francisco, where she became interested in the integration of natural stone into building and design. This led to her career path in the industry when she accepted a Project Associate position at Clervi Marble in San Francisco, which was started by an Italian stone mason in the early 1900’s, eventually achieving preeminent status in San Francisco and Northern California for almost 100 years. Wendy quickly moved into Project Management and Estimating, and combining her skills with Clervi’s tradition of quality craftsmanship, successfully merged clients’ ideas with old world marble skills resulting in a lot of spectacular stonework, such as the 24x24 Pelo Red Marble gracing the main floors of the Westfield Mall, the former San Francisco Center. Some of Wendy’s favorite commercial projects in SF include: 100 California interior flooring and exterior paving; Historic Lobby Restorations of The Adam Grant Building, 114 Sansome; The Central Tower at 703 Market Street, as well as countless lobbies, exterior cladding at SFO and lots of TI work. Residential work included penthouses and residences at the Ritz Carlton and Four Seasons, work for the Gettys’ and Hearst’s, as well as small and large projects throughout the Bay Area and Hawaii. Currently at ASN, Wendy works as a Senior Project Executive and in Sales. Some notable projects include 181 Fremont Street in San Francisco - AC porcelain tile for 67 luxury baths at the Private Residences. Pinterest HQ, 505 Brannan St. SF with 2cm MC porcelain pavers for the exterior landscaping as well as the interior lobby. 240 Lorton St, Burlingame, Exterior cladding with 3-5cm Lochness Romano limestone and Magnolia Black basalt. Sarbonne Exterior Cladding, Bel Air, CA: Avalon limestone planking. Eric and Wendy Schmidt Family Foundation / Alma Station: exterior travertine, split face limestone cladding and thick travertine pedestal paving on the roof decks. Other current projects include 600 California and 100 Pine - exterior natural stone paving, and exterior paving at several large private residences. Wendy recently accompanied project architects and engineers to St. Amour and L’Aime France to qualify Bleu de Savoie Marble for an expansive lobby floor that will grace the Joan and Sandy Weill Neurosciences Building at UCSF Mission Bay, a signature project that is currently under construction. Charles Sabia previously provided efficient logistics and overall effective operational processes for the tile and industrial/commercial construction industries throughout the San Francisco Bay Area. He brings excellent organizational management as well as a high level of customer service. He receives International stone and tile products from our vendors and distributes it throughout the SF Bay Area. He is a new addition to the ASN family and strives to exceed customer expectations. His attention to detail, can-do attitude and carefulness really helps keep ASN Operations running smoothly. Svetlana Stikhareva received her Masters Degree in Linguistics at Tula State, Leo Tolstoy Udsniversity in Russia. She began work as an interpreter for HeidelbergCement Rus, LLC., starting her first job on a construction site. After a year and deciding to develop herself in the construction sphere, she moved to GazProm, Russia’s largest gas company, where she started as an Executive Assistant to the Deputy Director General. Svetlana was then promoted to Procurement Engineer after two years and managed construction equipment procurement and delivery. From Linguistics to Logistics: She took a certificate in Modern Logistics and Procurement Methods at Saint Petersburg’s State University of Economics and within two years was promoted to Inventory Management Specialist where she managed vendor/client relations and oversaw accounts receivable and payable, and made many trips to construction sites in the North. After another promotion to Logistics and Procurement Specialist, Analysis and Reporting Management Specialist, Svetlana managed multiple databases for her work in financial planning, risk mitigation and as point of contact for internal and external auditors. During her 10 years as a specialist at Gazprom, her work was concentrated on the Yamal Megaproject, Russia’s largest energy project in history, which brings North Siberia Yamal Peninsula gas to Russia and Europe via the Bovanenkovo-Ukhta main gas pipeline infrastructure, and to Central Russia with the Ukhta-Torzhok main gas pipeline. Svetlana moved to the USA in 2018 because she got married, and recently joined ASN Natural Stone to work in logistics and other areas. She is looking forward to being involved in ‘difficult, challenging, complex and complicated projects’, and learning about natural stone to become a professional in the ‘stone world’ and to develop herself within the company. She is already instrumental, providing our clients with a high level of service that ASN is known for. "Encourage the competence, skill and correct choices needed to create long lasting, stable, safe and aesthetically appealing projects. Honesty before profits. Provide exceptional quality and service. Satisfaction for everyone working with ASN".